The Annual Christmas Lighting Award! When I was a young girl, my Mom and Dad would wrap us up in our winter coats and we would all pile into "Perky Polly" Peugeot to go for a drive and see the Holiday Lights. It was kind of a tank of a car and we could hop around the back seat freely, unrestrained from seatbelts, to allow us the best views of the lights from the giant windows in our giant car. At least that's how I remember it. Finally, winding through street after street of beautiful lights we would pull up to my Aunt Betty and Uncle Goon's house. The house was surrounded by a giant fence and trees and so the only thing you could really see from the street was the entrance to their two car garage. 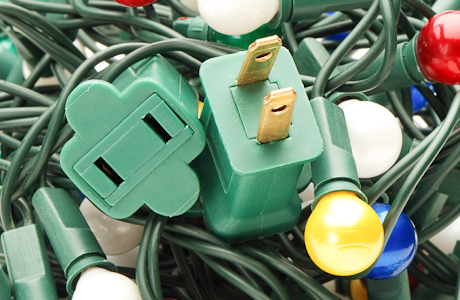 A lone string of hastily placed Christmas lights ran across the top edge of the garage. We walked into Uncle Goon's house and to our amazement there it was again. Sitting victoriously on the fireplace mantle was the Annual Christmas Lighting award. My brothers and I stared up at this giant trophy and peaked out the window again to look at the sad string of lights running along the roofside of the garage. We didn't ask alot of questions because we were immediately greeted with hot cocoa and questions from our Aunt Betty about what we wanted for Christmas. This was always one of our favorite things to talk about. The following year we would do the same thing. Year after year he continued to bring home the big prize. And year after year the string of lights seemed to get a little sadder and sadder. Finally, one year we asked Mom how it could be that Uncle Goon would win this prize every single year. There were so many houses that had lights stretching from top to bottom that were arranged in elegant patterns with lit up candy canes in their front yard. She leaned over and quietly whispered "Your Uncle Goon is the judge and the only contestant". The next year there was a simplistic beauty found in those string of lights that I hadn't been able to see in previous years. And somehow the hot cocoa even tasted better. The TravelingMoms are talking all about Christmas Tree Lighting Festivals around the country on their #TMOM #52Lights Twitter party Monday December 10 at 9pm EST. Join in the fun and tell us about your favorite light show. 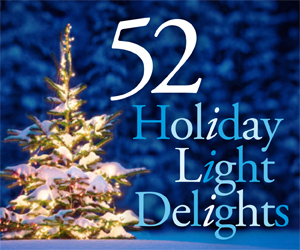 Check out the 52 Lights Ezine with pictures of some of the most beautiful light shows around the country. RSVP at Travelingmom.com for the party and you could win an iPad Mini in time for the holidays. From Travelingmom.com: Join the TravelingMom Twitter party Monday night to talk about holiday lights and holiday travel, sponsored by FlightCenter.com,DiscountCruises.com and HotCaribbeanDeals.com. I am inspired to create a contest that I know I can win every year. I love Uncle Goon!